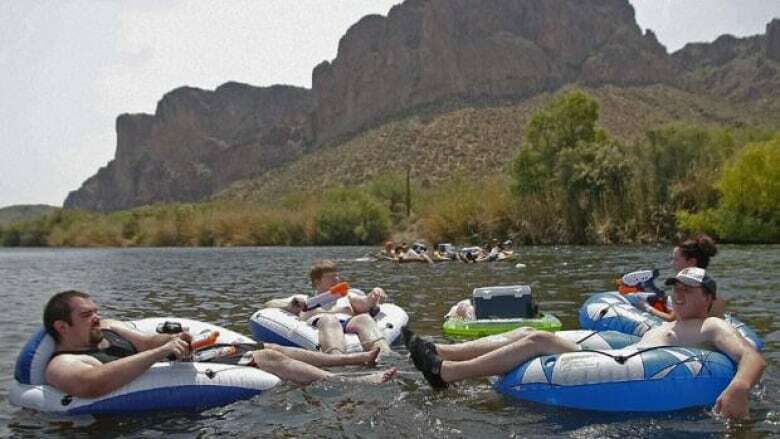 Scorching heat blistered the Southwest on Saturday, where highs between 46 C and 48 C were expected for parts of Arizona, Nevada and California through the weekend. Forecasters said temperatures in sunbaked Las Vegas could match the record of 47 C Saturday; as of late afternoon, it was 46 C. Phoenix hit 48 C by mid-afternoon, breaking the record for June 29 that was set in 1994. And large swaths of California sweltered under extreme heat warnings, which are expected to last into Tuesday night — and maybe even longer. Dan Kail was vacationing in Las Vegas when he heard that the temperature at California's Death Valley could approach 54 C this weekend. He didn't hesitate to make a trip to the desert location that is typically the hottest place on the planet. "Coming to Death Valley in the summertime has always been on the top of my bucket list," the 67-year-old Pittsburgh man said. "When I found out it might set a record I rented a car and drove straight over. If it goes above [54 C] I will have something to brag about." The forecast called for Death Valley called for 53 C Saturday, but it was just shy of that, according to unofficial reports from the National Weather Service. Death Valley's record high of 57 C, set a century ago, stands as the highest temperature ever recorded on Earth. A couple hours south in Baker, the temperature peaked at an unofficial 47 C in the road tripper's oasis in the Mojave Desert on Interstate 15. The strip of gas stations and restaurants between Los Angeles and Las Vegas is known by travelers for the giant thermometer that often notes temperatures in the triple digits. At the Mad Greek restaurant there, a waitress called out orders for "Chocolate shake! Strawberry shake!" while the temperature hovered at 44 C during the lunch rush. In Southern California, Riverside saw 105 degrees, and Palm Springs reached 40 C. At Lancaster Fox Field in Los Angeles County, temperatures reached 43 C, a record. To make matters worse, National Weather Service meteorologists John Dumas said cooling ocean breezes haven't been traveling far enough inland overnight to fan Southern California's overheated valleys and deserts. Rare Canada Day heat wave could break records in B.C. Burbank set a record overnight low with temperatures dipping to 23 C overnight, much warmer than the previous record of 20 C for Saturday's early hours. In Northern California, temperatures Saturday reached the mid 30s in San Jose. Farther north, triple-digit temps were reached in downtown Sacramento on Saturday, according to the weather service. Authorities say a man died and another was hospitalized in serious condition Saturday afternoon in Las Vegas. Las Vegas fire and rescue spokesman Tim Szymanski says paramedics responded to a home with no air conditioning and found an elderly man dead. He says while the man had medical issues, paramedics thought his condition was aggravated by the heat. Paramedics say another elderly man was on a long trip in his car when the air conditioning went out. Paramedics say he taken to the hospital in serious condition with heat stroke after he stopped in Las Vegas. Health officials warned people to be extremely careful when venturing outdoors. The risks include not only dehydration and heat stroke but burns from the concrete and asphalt. Dogs can suffer burns and blisters on their paws by walking on hot pavement. Cooling stations were set up to shelter the homeless and elderly people who can't afford to run their air conditioners. In Phoenix, Joe Arpaio, the famously hard-nosed sheriff who runs a tent jail, planned to distribute ice cream and cold towels to inmates this weekend. Officials said personnel were added to the Border Patrol's search-and-rescue unit because of the danger to people trying to slip across the Mexican border. At least seven people have been found dead in the last week in Arizona after falling victim to the brutal desert heat. Temperatures are also expected to soar across Utah and into Wyoming and Idaho, with triple-digit heat forecast for the Boise area. Cities in Washington state that are better known for cool, rainy weather should break the mid 30s next week. The heat was so punishing that rangers took up positions at trailheads at Lake Mead in Nevada to persuade people not to hike. Zookeepers in Phoenix hosed down the elephants and fed tigers frozen fish snacks. Dogs were at risk of burning their paws on scorched pavement, and airlines kept close watch on the heat for fear that it could cause flights to be delayed. Are you dependent on air conditioning?